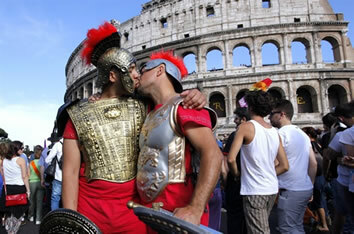 One of the world's great capital cities, Rome, Italy hosts a popular Pride celebration. 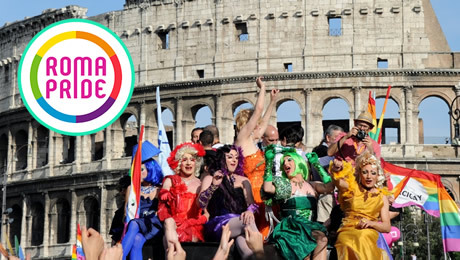 Join thousands of gay, lesbian, bisexual & transgendered people and friends, locals and visitors at Roma Pride, the city’s largest annual gay celebrations. 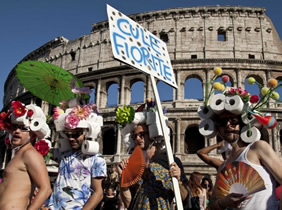 Throughout Pride week (the preceding several days leading up to the weekend), a series of related events will take place - including parties, concerts, film screenings, and lectures - in Testaccio's Eutropia-Città dell’Altra Economia, which during this week becomes Rome's Pride Park. • In the late afternoon Meet & Greet with your LGBT Tour Leader at the hotel and exclusive aperitif in a LGBT Friendly location in Trastevere district. • Afterwards welcome dinner at a local restaurant. • Together with your LGBT Friendly Tour Guide, you will discover the magic and the secrets of the city! • Start your short walking tour through the Eternal City. • Visit the ancient Rome tour with the legendary Colosseum, one of the largest amphitheater built by Roman Empire with more than 50,000 seat, in which gladiator contests and public events took place. • Afterwards continue to the Roman Forum and admire the magnificent Arch of Constantine, erected by the Roman Senate to commemorate his leadership. • Finally reach the celebrate Trevi Fountain, the Pantheon and Piazza Navona. • Lunch on your own to taste local specialities like Pasta alla Puttanesca or Amatriciana. • In the afternoon be ready to celebrate! • Get part of this amazing and peacefull battle for equal rights against any kind of discrimination. 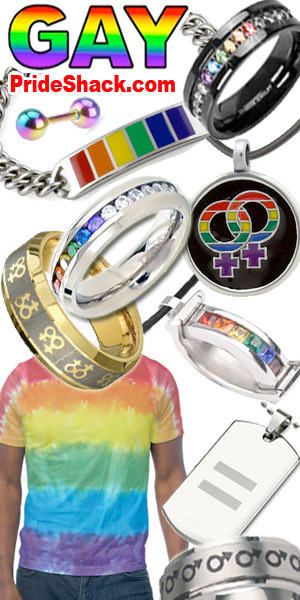 Rainbow Tips: Live the vibrant LGBT atmosphere in one of the many pubs like Muccassassina or Gay Village. Web Page © Happy Travel, Ltd. Logos and Images © Atlantis Events Inc., Ignas Tour, etc.